Ardfert Village – Home of St Brendan & Sir Roger Casement Landing. Trip Advisor has published its annual list of Ireland’s best beaches, a round-up dominated this year by the Kingdom. While Inchydoney is named Ireland’s No.1 in the Travellers’ Choice Awards, Kerry takes six places in the Top 10 with our own Banna Strand coming in second. Or you might come to look at Ardfert’s more recent history… It was here that the early moves in the 1916 Easter Rising against British Rule took place. Roger Casement was to meet the German gun-running boat here to help sufficiently arm loyal Irishmen to overthrow centuries of foreign rule. 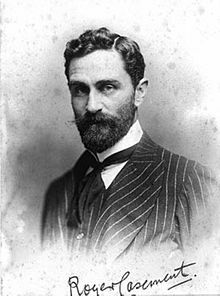 Casement landed on the world-famous Banna Strand to try to get the message through to the Rising leaders in Dublin that the arms had not arrived, but he was arrested, tried and executed. The place of his arrest and a monument to the landing can both be visited. Why come to Ardfert in the beautiful South West of Ireland? 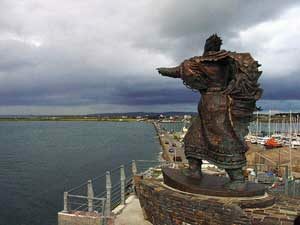 St Brendan Statue at Fenit St. Brendan the Navigator is reputed to have discovered North America prior to Christopher Columbus. It is purported that Christopher Columbus read reports of rendan’s journey before commencing his own later voyage. 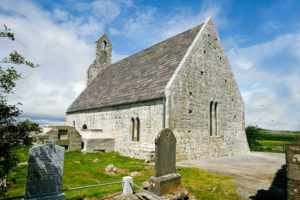 St. Brendan’s legacy in Ardfert is evident, the great cathedral which rises over the village skyline is said to be built on the site of a monastic settlement founded by Brendan. Ardfert later became the Medieval capital of Kerry.A few hundred yards away from the cathedral lies the 13th century Friary. 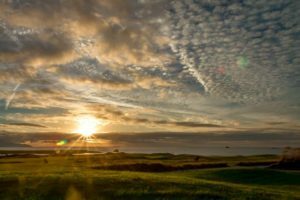 Or perhaps you might come to Ardfert to play golf at one of the top courses in the world… In the parish is the world-ranked Arnold Palmer designed Tralee Golf Club. Designed and built by Arnold Palmer, this stunning setting represents a true paradise for those willing to challenge what is widely acclaimed as one of the finest links courses in the world. Smitten at first sight, Palmer would later go on record with this memorable quote: “I may have designed the first nine, but surely God designed the back nine”. There is also a challenging 9 hole course in the village. And we’re on the Wild Atlantic Way – the famous tourism trail that has helped boost Ireland’s attractiveness to visitors, a 2,500km scenic driving route that “snakes its way round every nook and crook of the western seaboard from Donegal to Cork.” . It is the longest unspoilt stretch of coast way in Europe and North America. Tourists will discover an extensive range of activities in Ardfert and the surrounding area. 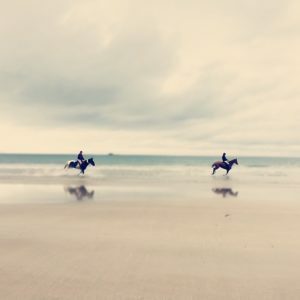 Surfing in Banna Beach, Sailing in Fenit, Angling, Bird-watching, Cycling, Walking, Painting our beautiful medieval buildings and our magnificent scenery. Enjoy visiting our holy wells which predate Christianity and are part of our celtic mystical heritage. Explore St. Brendan’s Cathedral and the Franciscan Friary. We have an excellent selections of pubs and restaurants in Ardfert and its immediate hinterland. Arrive a stranger. Leave a friend. For more information regarding these activities check sponsored links. Perhaps you like messing around in boats? No problem – just a few miles down the road you will find Fenit marina with its pleasure boats and fishing for all standards, whether it’s just beach-casting or boat trips to fish the Atlantic. www.fenitharbour.com World Class Beaches or it might be for leisure?Then again you might come to relax at Banna Strand – 9 miles of heaven with a child-friendly Banna Beach Hotel to provide all the facilities you need. But perhaps you’d really just like to relax in the warm hospitality that tourists always get – enjoy coming to this area and enjoy the music and the chat. Shannon. And we are just 20 miles or so from Killarney and Dingle, So why not pop in to see us and enjoy hospitality that is second-to-none. We’re good for the heart. 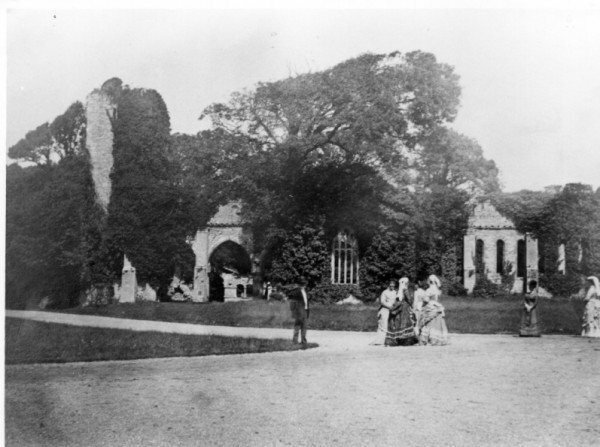 The Crosbie family were granted land in the Ardfert area by Elizabeth I in the late 16th century. After the Desmond Rebellion of the 1580s the ownership of huge swathes of land in Munster was transferred to supporters of the English crown. Amongst those who gained land was an Irishman, John Crosbie, who became the second Protestant Bishop of Kerry in 1600. John had five sons and one, David, settled at Ardfert. David built the first Crosbie mansion house in Ardfert in the 1630s on a site near the Franciscan friary. This first house was burnt during the 1641 uprising, suffering the same fate as the Cathedral. Over the generations the Crosbies became influential in local and national politics, various sons served as MPs, Privy Councillors and Governors of Kerry. William Crosbie was appointed Viscount Crosbie in 1771 and in 1776 became Earl of Glandore. The Glandore Gate in the centre of the village preserves this title. This imposing entrance constructed in the mid-19th century was once one of the entrances to the Crosbie mansion. It was relocated to its present position in the 1880s and is now a private dwelling. The Crosbies were the main landlords in the area, and when William Talbot Crosbie died in 1899 he owned nearly 10,000 acres. In the middle of the nineteenth century he began to redesign his estate in Ardfert. The subsequent demolition of dozens of houses and the eviction of tenants led William to become known locally as Billy the Leveller. William’s son Lindsey was a more benevolent landlord and one of his contributions to the village is still functioning. 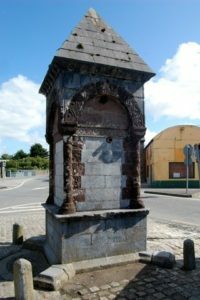 In 1901 Lindsey had the fountain in the centre of the village constructed as a memorial to his brother; it served as the public water supply to the village for nearly 70 years. The Crosbie family left the Ardfert area in the early 1920s and on August 3rd 1922 the IRA ordered that the “big house”, situated behind the Friary, should be burnt to prevent its use by Free State troops. This photograph shows the house before its demise. The Cathedral that we see today dates from the 11th century, however, as with many building of this age it has undergone substantial changes over the centuries. 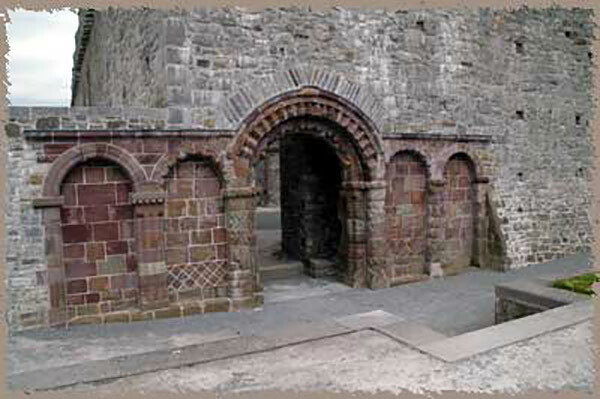 One of the gems of the site is the Romanesque style west doorway, part of an earlier church constructed in the mid-12th century and incorporated into the later building. The cathedral is an Early Gothic structure constructed primarily in the 13th century with large battlements added in the 15th century. It is built of limestone with highly carved sandstone decoration around the doors and windows. One of the most impressive aspects of the 13th century building is the beautifully carved windows in the chancel comprising the three lancet windows in the east end of the building and the nine lancets on the south side of the choir. During the late 16th century Ardfert was caught up in the Desmond Rebellion and the cathedral was severely damaged although it appears to have continued to function. However, in 1641 during the Irish uprising the building was destroyed by fire and abandoned. In 1671 the south transept was rebuilt and served the Protestant congregation until the 1870s when a new Church of Ireland church was built in the village. After this the cathedral ceased to serve as a place of worship; a situation that continued until May 16th 2013 when an open air mass was celebrated as part of The Gathering 2013.
the time the battlements were added to the main cathedral building. It may have served as a daily church with the cathedral reserved for special occasions and religious feasts. The transept of the cathedral now functions as a visitor centre from May to September, telephone 066 7134711 for opening hours. The cathedral grounds are accessible all year round. 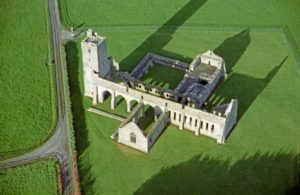 Ardfert Friary stands in a secluded and peaceful position half a kilometre to the east of the village. The Friary was founded about 1253 by the Anglo Norman Fitzmaurice family and it has had a chequered history. It was originally built as a Franciscan foundation but in the 16th century it was occupied by English soldiers and later by Protestant bishops. The layout of the building follows the standard layout of most Franciscan friaries comprising a large church for both friars and the local population with a cloister and residential offices for the friars to the north of this church. A large portion of the structure still remains including one side of the cloister walk. A residential tower was added to the west end of the church in the 15th century. It contains five floors each with a single room, some with window seats and garderobes (toilets). Unfortunately the tower is not accessible to visitors. 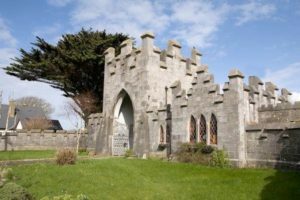 In the 17th century the Friary became absorbed into the estate of the Crosbie family, the local landlords in the Ardfert area, and became an ornament in the grounds of “the big house”. 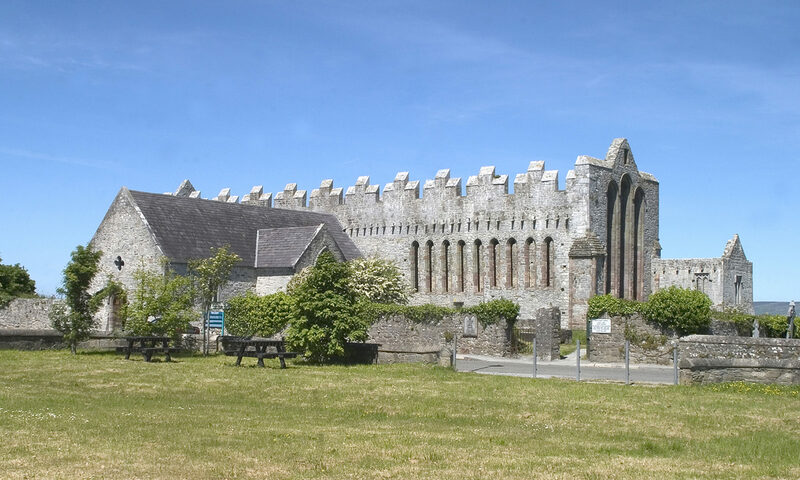 Ardfert Friary is an open site accessible to visitors year round. Access is on foot from a public car park, a walk of about 5 minutes.